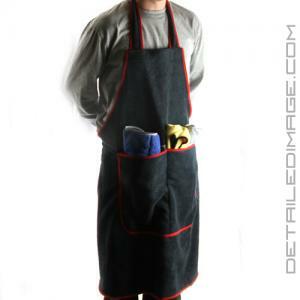 The DI Microfiber Detailing Apron is the perfect way to protect your paint from scratches! When detailing you have to be careful of any belts, buttons and zippers from coming in contact with your paint. Even some fabrics, stitching's and logos on your clothes could be harmful to rub against the paint. This can be tough when you are working quickly or stretching to reach those hard to reach areas. Simply throw the strap over your neck, tie it around your waist, and you will be worry and scratch free! This apron is made of extra soft microfiber and it will protect your paint from any metal or plastic pieces on your clothing. This apron is one size fits all and it has two front pockets for easy access to any tools or microfiber towels you are using. If you are looking for a way to help protect your paint when detailing, look no further then the DI Microfiber Apron! I recently purchased the DI MF Apron. I didn't think much of it initially, why would I need an apron for detailing. Sure enough I have found it more than valuable! Using a MF Apron does ensures that my t-shirt, or pants don't marr or scratch the paint while I lean up against it doing hard to reach areas. The center of the roof or hood come to mind. Good item, wish the pockets were deeper and the top loop was adjustable - will have the wife cut it and add velcro, I think. Love it! Soft and fits nice! I wish though there was an adjustment for the neck. Love this apron. The pockets allow you to keep an inspection light and a towel on you at all times, and you also don't need to worry about leaning over and rubbing against panels.